Posted March 3, 2017 . The story of Zoey. 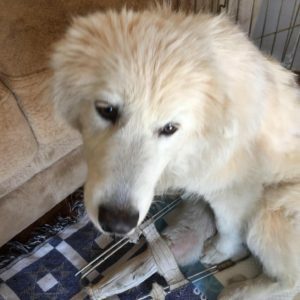 Last night we received a call from the Animal Rescue of North Georgia who had a 7 month old PYR that had been hit by a car and could no longer walk. 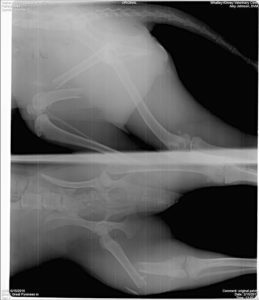 X rays revealed both back legs were fractured and one hip would also require surgery. We were in communication with our orthopedic at 10:30 last night. We have transported Zoey this morning and she will be operated on this afternoon. Robyn, one of our best fosters, has already stepped up and will nurture her during the healing process. Liam, our gunshot PYR, had surgery last Friday and look at the progress he has already made with Sherry. The way our GPRA people respond to a PYR in crisis is beyond remarkable.